In one of the most expensive campaigns in Oregon history, Kate Brown wins another term as governor. 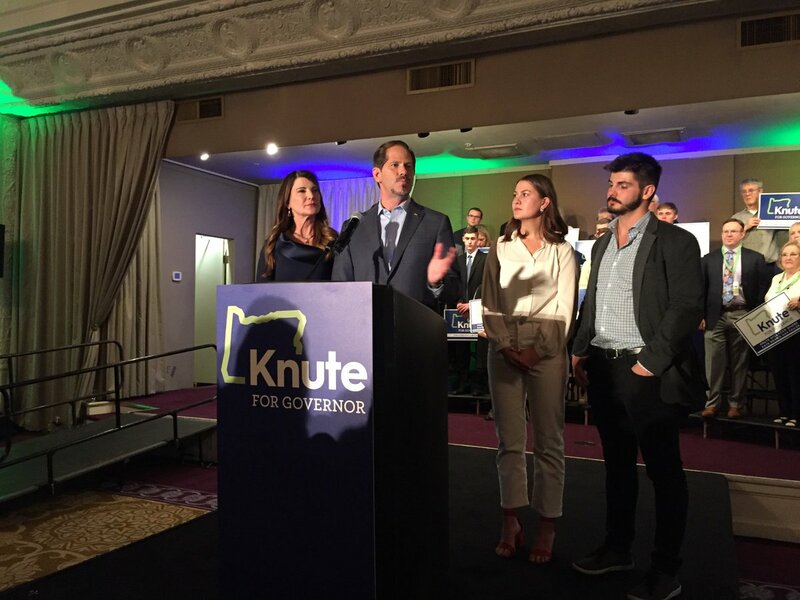 Democrat Kate Brown appears to have won reelection to become Oregon governor, defeating Republican challenger Knute Buehler. The Oregon Secretary of State’s office shortly after 8:20 p.m. showed that, after 1.3 million votes, Brown carried 50 percent of the votes, compared with Buehler’s 44 percent. Brown’s victory would cap a year-long campaign that set a new state record for campaign funding. Her and Buehler combined to spend more than $30 million, according to the Secretary of State’s office. Brown, the incumbent, first rose to the position in 2015 following the resignation of former Gov. John Kitzhaber. She then won reelection, against Republican Bud Pierce, in 2016. Buehler, from his campaign event at the Sentinel Hotel in Portland, conceded defeat shortly after 8:30 p.m. Joined onstage by his family, Buehler thanked supporters and said he was disappointed. "My voice will not be leading this state for the next to four years and I certainly accept that decision, but also let's be very clear: the status quo in this state is not tolerable," he said. For $5 a month, get a digital subscription. Few details are available, but the Malheur County District Attorney's office confirmed police are tracking down leads on the incident that occurred early this morning. From farmland to mobile home parks, legislators are looking for ways to preserve and expand affordable housing. Finding millions to do so remains a challenge at the Oregon Legislature. Here's an Easter treat for our readers! Check out the photos from the annual Easter Egg Hunt hosted by the Vale Lions Club, with support from the Vale Chamber and local businesses. The event drew a crowd of families to the city park on Saturday, and the hunters were not deterred by damp weather.